This performance saw the dancers from Ballet Cymru reunite with Wales’ most adored performer, Cerys Matthews, and the nation’s favourite harp player Catrin Finch. What a combination. In the first half the songs Cerys performed were from Tir, her take on Welsh song spanning the centuries and our nation’s culture. They ranged from Ar Hyd y Nos and Myfanwy and jolly upbeat songs Migldi Magldi and Bachen Bach o Dincar. Darius James and Amy Doughty’s choreography was like a youthful blast of energy into the music of a country. The dancers were choreographed to be both listeners to Cerys’ singing and interpreters of the songs. Cerys also charmed her audience with backstories of the songs, their development, their significance and always brimming with her own passion for them. The dances varied as much as the songs, starting with almost flower power happy ensemble work, all leaps and jagged gestures, smiles and zippiness transforming into lithe and elegant classical duets and then drop dead gorgeous solo work. Finally, the dancers again assembled around Cerys as this rather special twmpath ended. 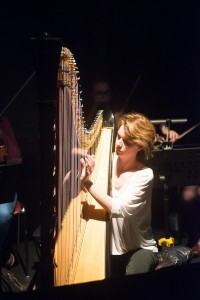 After the interval the tone changed as Catrin Finch joined musicians from Sinfonia Cymru as the mood and style melded into a perhaps more conventional ballet performance inspired by the composition of the contemporary champion of our national musical instrument. First Catrin chatted to the audience about her music, the humbling experience of the work being given human form through dance, and read a short war poem that inspired her first short piece for the performance. This proved a gentle, lyrical precursor to the dancers joining the musicians for the three part Celtic Concerto. The excitement of the first movement which she explained was best described as a jig was uplifting and pithy, with the dancer surfing on the strings and racing rhythms. This was then subsumed by darker, refined choreography set against projections that resembled vast stained glass windows for the second movement Hiraeth which enabled our national chamber ballet company to develop sumptuous movement. The concerto and the choreography then transformed into the mesmerising third movement Solstice and this rather special evening drew to a polished and refined conclusion.